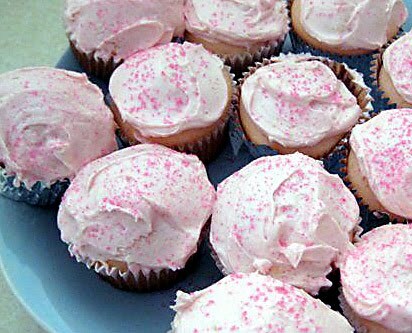 Monkey Inspirations: Pink Champagne Cupcakes!!! My new girlfriend Ruthie (a.k.a Rufie) was gracious enough to share her pink champagne cupcake recipe with me. From what I've heard she is an awesome cook who enjoys drinking a cocktail or two while preparing a meal. My kinda gal. Here's what you'll need to create these delicious cupcakes. Preheat oven to 350 degrees. In mixing bowl add cake mix, champagne, vegetable oil, eggs, and food coloring. Mix on medium speed for 2 minutes. Insert cupcake papers inside cupcake pan. Pour mixture into individual cupcake holders. I like to fill to almost full because I like my cupcakes to look big and fluffy. Place in oven for 17 -22 minutes. In another bowl add softened butter, powdered sugar, champagne, vanilla, food coloring drops, and mix until well blended. Once cupcakes are completely cooled you can frost, and decorate as desired. Oh I forgot the most important step according to Ruthie. Drink the champagne, and invite a friend to help you out. With the bottle I mean. Thanks Ruthie! Cheers.